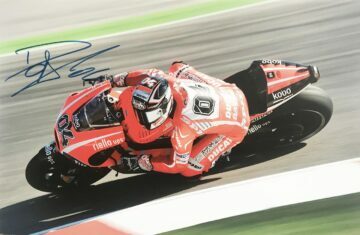 Shop our signed Andrea Dovizioso Moto GP memorabilia, autographed photographs and signatures from the Italian star. 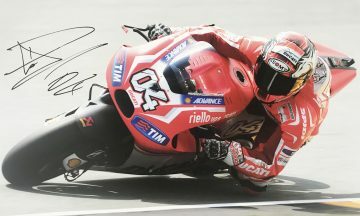 Signed Andrea Dovizioso photographs, shirts & caps. All with a Certificate of Authenticity, fast international shipping and free UK delivery! 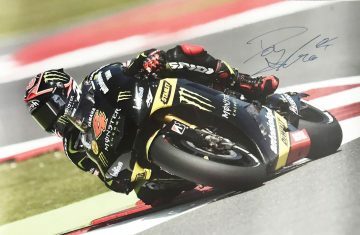 Italian Moto GP ace Andrea Dovizioso has been on the circuit just shy of a decade – but he shows no signs of stopping yet. 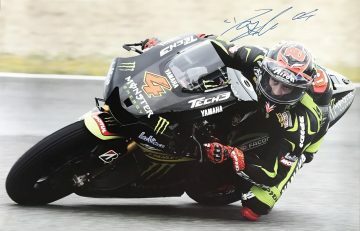 His best finish yet is in second place – but each year he moves in closer on the ultimate goal, a Moto GP championship win. 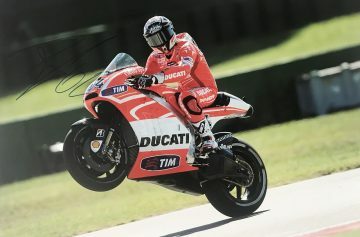 Dovizioso inherited his passion for superbike racing from his father, Sicilian motorcycle racing champ Antonio. 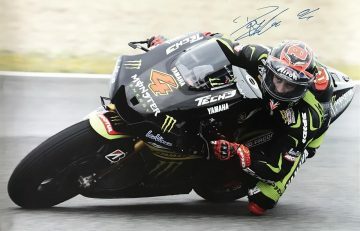 He started as most racers do on the 125cc circuit, mentored by former rider and mechanic Guido Rossi for a short time. 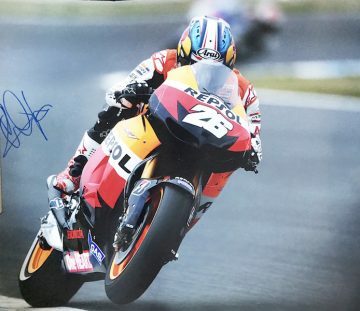 Experiencing success in his early years he moved on to the 250cc class, performing so brilliantly he clinched the Rookie of the Year award. 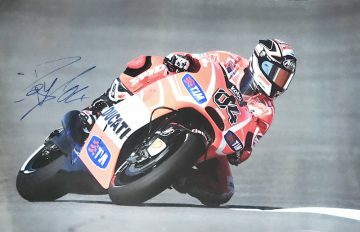 2008 saw Dovizioso’s debut in the Moto GP class, achieving a respectable fourth place finish in his very first race. From then on his performance went from strength to strength, and the next few years featured triumphant wins, podium places and fantastic finishes. 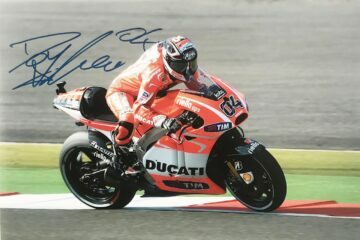 Although to date a Moto GP championship win has eluded him, Dovizioso has 11 wins, 50 podiums and 7 pole positions to his name. 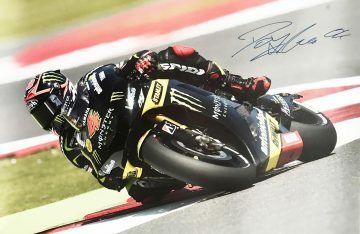 He has been a race winner on 9 occasions, fending off fierce competition from legends including Valentino Rossi and Cal Crutchlow. 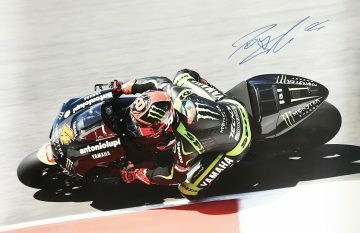 In 2017 he finished second place – perhaps a glimpse of what’s to come for the Italian superbike star as he edges closer to glory. 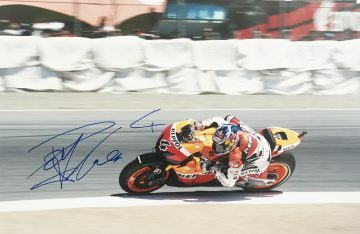 Our collection of Andrea Dovizioso signed Moto GP memorabilia includes a fabulous selection of ephemera autographed by one of the sport’s most popular rising stars. 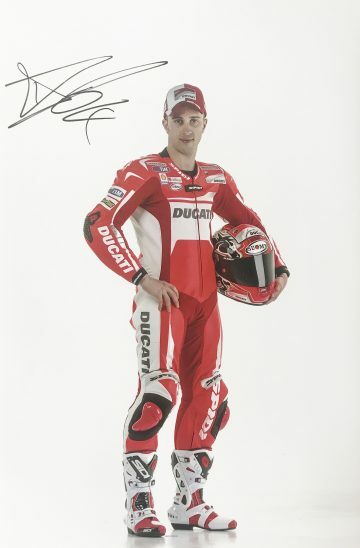 Browse now to view gloves, helmets, clothing and photographs, all 100% genuine and authentic.